Hello! 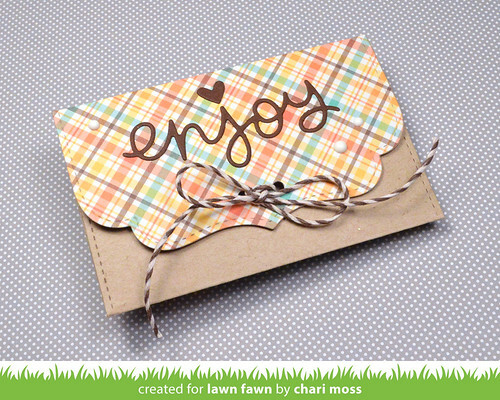 Today is the final day of Lawn Fawn inspiration week and I have a Small Stitched Envelope project to share. This envelope is the perfect size for a gift card so I decorated my envelope to be filled with a starbucks gift card. I used the Perfectly Plaid Fall papers along with Love You a Latte. On the front I white embossed the sentiment and paper pieced the sleeves on the cups with plaid papers. I also cut out dark brown cardstock hearts and used them on the sleeves as well. I die cut just the flap of the envelope from plaid paper and layered it over the kraft cardstock for a cool look on the back with the two different papers. I die cut the "enjoy" sentiment from the same dark brown cardstock and used one of the hearts to dot the "j." I punched some holes in the flaps so that I could add twine tie the envelope closed. 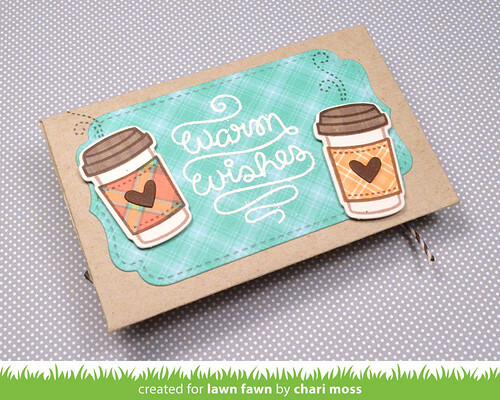 Visit the Lawn Fawn blog for more projects! WOW Chari, this is precious. I love that you did the flap in the plaid paper. Makes both sides so awesome. A fantastic job! Great gift for that coffee lover in our life.